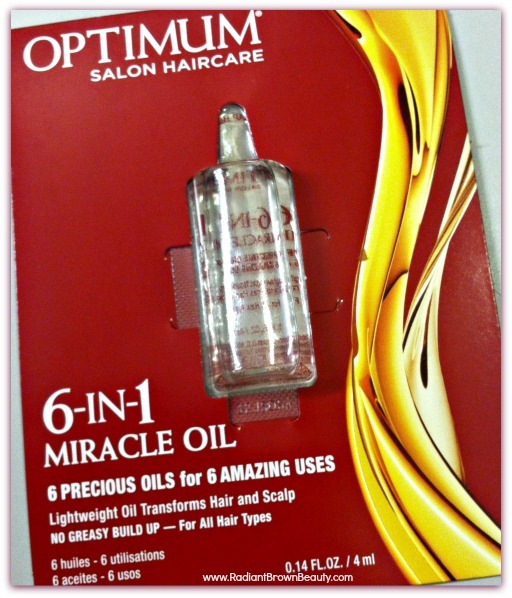 Last night, Soft Sheen Carson launched a new Optimum Salon Hair Care product, the 6 in 1 Miracle Oil. My daughter and I attended the event among a couple hundred naturals from around the NYC area, including my bloggy hair friend Shelli from Hairscapades (You’ll find some of her photos here). Curly Nikki hosted the event and Tracee Ellis Ross was there with her absolutely gorgeous self. Tracee is the newest spokesperson for Optimum Salon Hair Care. Here is a slide show of the photos I snapped throughout the night. The party was fun. The DJ did her thing. Even, the activities were fun. 3 women who snapped the most photos during the night and upload them to the Optimum Salon Hair Care Facebook page won a door prize that consisted of a year’s worth of hair care products. I didn’t win but I’m soooo at peace with that. You’ll discover why in just a moment. I was so excited when the representatives from Soft Sheen Carson shared the combination of 6 natural hair oils. I couldn’t wait to get my hands on a sample or hopefully full size product. And, they were so generous they gave us 2. They say it contains: Argan, Coconut, Sunflower, Apricot, Jojoba and Avocado oils. Great right? Not. Why is this stuff chock full of things I can’t even pronounce??? Why not just the oils? OK. I get that a small amount of preservative may be required to extend the shelf life but that should be waaaaaaaay at the end of the ingredient list. What’s up with the alcohols and even worst – what the heck is 42893SS1 ??? And here’s the kicker. The package highlights that there’s no silicones, mineral oil or parabens. I’ll take silicones any day over 42893SS1 – whatever that is. Oh and there’s a caution on the package. It’s flammable. Could it be the added chemicals? This is very disappointing. Honestly, I don’t care if it makes my hair glow like Jesus at the resurrection. I can’t co-sign with this suspect list of ingredients. Sound off: What do you think about this new “Miracle Oil?” Have you tried it? My hair isn’t that dry – but I didn’t want to guess which product had the right amount of moisturizing for my hair. I bought the Shielo Restoration Oil to just go all out and moisturize the heck out of my hair and scalp. I was concerned about it weighing my hair down. After ysinh the SHielo Hair Oil, my hair is now very soft and shiney! This oil really does work for any hair if it works on mine. The first ingredient is 42893SS1 Isopropyl Myristate. The number denotes the CAS number. It is used in cosmetic formulations to thicken creams, provide emolliency, & in this case impart a sheer smooth feel and application. As a first ingredient it is being used to lighten the normal heavy emolliency of the natural oils much the same as a silicone ingredient does when used in a formulation. Isopropyl Myristate is not toxic although it does clog pores and contributes to cosmetic acne. LOL I figured as much. I can’t wait to see more pics. I posted a comment on your blog when I first saw the wedding photos and it disappeared?? I WISH I WAS THERE!!!! I love Joan aka Tracy!! LOL when I see her all I see is Joan. The funny thing is she seems a lot like her character. Yeah, that list of ingredients is a turnoff, for real! some ppl think that I’m being a little harsh but that’s just me. I keep it real. Whoever doesn’t like it oh well. I’d rather ppl know that I’m sharing my real opinions about products than not. Hi there! I was at the launch party as well and I just sampled my “sample” today and well, when I looked at the ingredient list I had the same thoughts… I mean the party was nice, and the presentation was fabulous (anything is fabulous when Curly Nikki and Tracee Ellis Ross are the hosts!) but I don’t think I’m too convinced about this oil and what “they” claim make it so very special. LMBO!!!! Michelle, you are frickin’ HEE-larious!!! I am chuckling away in my head!! LOL!! You got some great pics!! I need to jack some of those;)!! You got to see Tracee outside up close and personal?!?!?! I am soooo jealous!! Her hair and NIkki’s hair were frickin’ AWESOME!!! I thought Nikki’s hair looked huge and now I saw that she got it cut again … no wonder the volume was so pumped up, I LOVED it!! And you and Kyra … too cute!!! I love how you guys spend so much time together enjoying things like this together. It really seems like you two are best friends and that is awesome (when they are old enough to understand that mom first, friend second;). Giiiiirl you know I’m not even playing when it comes to product reviews. I’m not saying things have to be all natural but dang really? I thought this miracle oil would just be oils all rolled up and nice. Nikki’s hair did look nice but I thought it was even more pumped at the last event. Traci’s hair was def. drool worthy! I try to expose Kyra to events and things that are about teaching her to care for herself. She wasn’t raised being allowed to club or hang out too much so now that she’s older I want to show her a different way. Of course, now that she’ll be 18 in a few months she is trying to hang out more! Girl it looks like you had fun! You and your daughter looked fabulous! I almost choked from laughing! LOL!! !